#BEGOLDEN is a powerful initiative that reminds people of the Golden Rule – to treat others as we want to be treated. With the often negative rhetoric and focus on immigrants, this campaign promotes thinking and acting with kindness and compassion to build a strong community together. #BEGOLDEN exists to educate, inspire and generate action – and it is gaining momentum. When Bishop Edward Burns moved to Dallas, Texas in 2017, he saw a need for a healthier conversation about immigrants, who represent 25 percent of the population in this area. Many political, faith, business, school and community leaders agreed. With the work of Richards-Lerma #BEGOLDEN was created to help leaders set a more positive tone by adhering to The Golden Rule — ancient wisdom for our modern times. At the start of April, 2018, the Dallas skyline was lit up golden, and #BEGOLDEN received thousands of media, social, and digital impressions. The Belo Corporation provided print and digital ads for the year, valued at about $250,000. Schools are engaging students in #BEGOLDEN in personal ways, as classes and as members of their particular schools to build a more welcoming community. With the help of the #BEGOLDEN brand, business leaders are sharing messages of support and acknowledgement of immigrant contributions, as well as offering community service opportunities to benefit those who need help. Stickers, decals, fliers, brochures, yard signs, and more are helping us to gain exposure throughout our community. Golden Tables – Bright metallic gold picnic tables with a plaque featuring The Golden Rule are being distributed to 100 schools and community centers in the Dallas area to provide a peaceful place to gather and help teach and remind our neighbors about the Golden Rule. #BEGOLDEN Welcome Walls are installed at airports, the convention center, libraries, and other public areas to encourage people to be more welcoming to those from other areas and other countries. Additional cities are launching #BEGOLDEN, including Louisville, Kentucky and San Antonio, Texas. How Can You Support #BEGOLDEN? Visit and share begoldenjourney.com, and ask your team and others to follow #BEGOLDEN on Facebook, Twitter, and Instagram to help create more traffic. Support building the #BEGOLDEN brand and additional educational materials and activities for educators, faith leaders, youth groups, and business organizations. 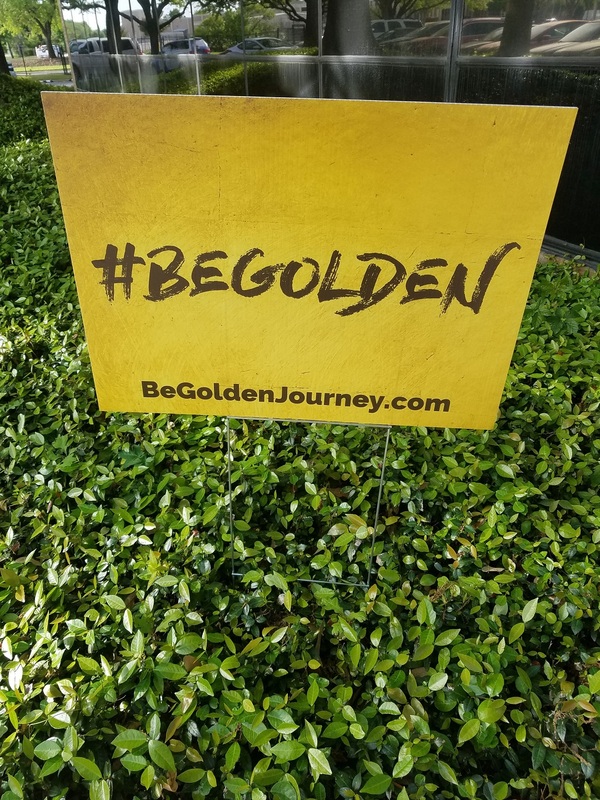 Send any questions or ideas to info@begoldenjourney.com.